AloeTouch Scented Wipes - 8 x 12"
The first ever X-Large premoistened wipe that is flushable and dispersible. Made of 98% cellulosic fibers, these wipes are highly biodegradable. The high cellulosic content and bonders provide strength in use, but quickly break down in the toilet. This unique, patented design called Hydraspun is exclusive to Medline for the healthcare market. ReadyFlush is three times larger and truly dispersible unlike other flushable wipes that don't break down.The larger size allows for quick and easy clean-ups with fewer wipes. ReadyFlush breaks apart when flushed and is safe for sewer and septic systems. More importantly, ReadyFlush is safe for use on patients' skin, is hypoallergenic and pH balanced. ReadyFlush cleans and moisturizes the skin with clinically proven Phospholipid EFA and soothes with the touch of aloe in every wipe. The ability to dispose of ReadyFlush wipes in the toilet provides an added measure to reduce cross contanimation. Pathogens and odors are flushed away and won't linger in the waste receptacle. Soil loads and human excrement are disposed of in the toilet where they belong. ReadyFlush is a practical tool and supports hospital waste reduction efforts. As a biodegradable product, ReadyFlush supports the vision of Hospitals for a Healthy Environment (H2E). ReadyFlush is compatible with commercial grade plumbing systems, and is safe for wastewater collection and treatment systems. 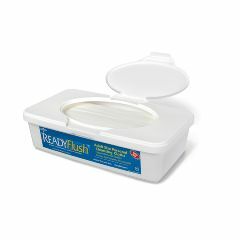 ReadyFlush meets the acceptance criteria for flushability as provided by the National Sanitation Foundation (NSF). In addition, ReadyFlush passes the ASTMTest Standard E1720-01 for aerobic biodegradability as administered by the Stevens Institute and the Flush Index Dispersion Test for dispersibility. Observable and measureable change results when ReadyFlush is agitated in water. It disperses just like toilet paper. Large enough. Lightweight. Sturdy. Easy Storage. Following Surgery. Adult disabled person. Emergency. Excellent to clean disabled adult. Comfort bath cloths are too expensive for cleaning several times a day, and other wipes are too small. These are appropriately sized to clean an incontinent adult and are also more affordable than comfort bath cloths (which really are made for bathing). Good product, but cost me a plumber's visit - clogged toilet.. Not flushable. I started using these when I was caring for my father but now I use them myself. I have a bidet seat at home but away from home these wipes help me feel nice and clean. Sure would like to see a refill size to match the original amount you get in the tub. Refills are too small. This product was a God send. The ones we purchased at the store were small and messy. One of these is large enough to do the job. do you have unscented flushable wipes, non allergenic?